A PUSH FROM THE BAKER ADMINISTRATION to respond to a Supreme Judicial Court ruling and reinstate a policy allowing state and local police to cooperate, on a limited basis, with federal immigration detainer requests met stiff resistance from civil liberties activists who questioned the constitutionality of the governor’s actions. As foreshadowed last week, Gov. 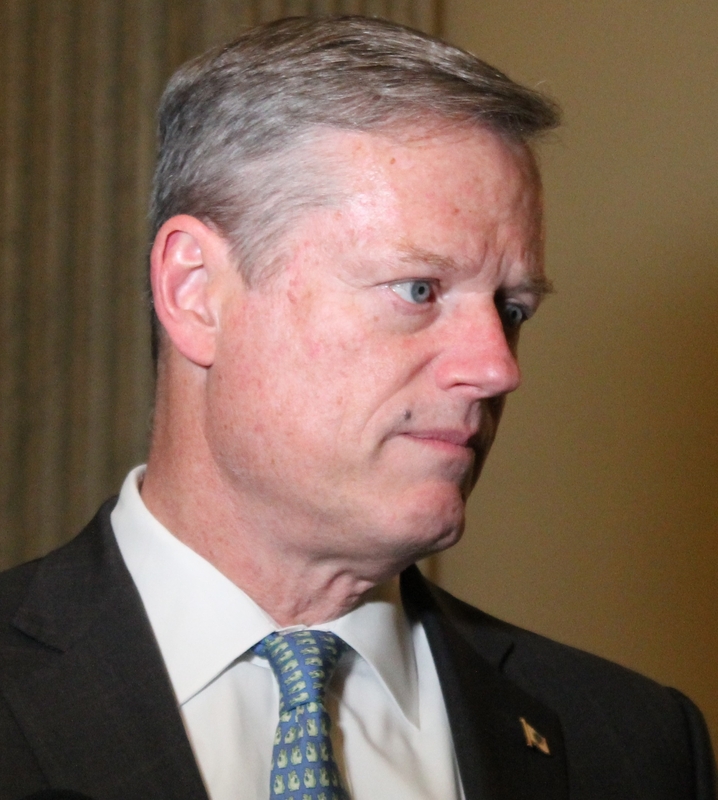 Charlie Baker filed legislation Tuesday that would allow state and local police to honor Immigration and Customs Enforcement detainer requests for individuals already in state custody on criminal charges or for sentences related to past violent crimes. The proposal from the Baker administration comes a week after the state’s highest court ruled state law did not allow for law enforcement in Massachusetts to hold defendants at the request of the federal government for immigration violations if they had no other reason to keep the person in custody. deportation machine. Why Gov. Baker would attempt to aid President Trump is unsettling – as both a legal and political matter,” ACLU of Massachusetts Executive Director Carol Rose said. The practice Baker is looking to codify in state law of honoring certain ICE detainer requests had been in effect for a year before last Monday’s Supreme Judicial Court decision. The case was brought by a Cambodian refugee who was held by the Boston Municipal Court at the request of ICE after unarmed robbery charges had been dismissed. The measure to be filed in the House seeks to reinstate a policy put in place by the Republican governor in 2016 that expanded the level of cooperation between state and federal law enforcement over immigration, but focused only on those with a serious criminal history. Baker’s bill stops short of the legal changes sought by more hard-line conservatives such as state Rep. James Lyons, who wants state and local police to be authorized to enforce federal immigration law. The bill would allow, but does not require, police to hold an individual at the written request of ICE for up to 12 hours if that person has engaged in or is suspected of terrorism, has been convicted of a crime involving a street gang, has been convicted of a non-immigration related felony or a state crime such as domestic violence, sexual abuse or human trafficking. Public Safety Secretary Daniel Bennett said Baker’s proposal does not allow police to enforce federal immigration law. The detention of anyone for longer than 12 hours at the request of ICE would be subject to judicial review, under the bill. Democratic candidate for governor Jay Gonzalez responded to Baker’s proposal by emphasizing his support for the Safe Communities Act, legislation which would prevent police in Massachusetts from acting as federal immigration agents. That bill has had a public hearing but has yet to receive a recommendation from the Public Safety and Homeland Security Committee, a panel controlled by Democrats. “Governor Baker is going out of his way to try to help Donald Trump enforce immigration laws. It’s not the job of state and local law enforcement, nor should it be,” Gonzalez said in a statement. Another Democrat running for governor – Newton Mayor Setti Warren – called the bill a “political move, plain and simple” to shore up the conservative base of the Massachusetts Republican Party that has not always been on Baker’s side. Baker does not support the legislation referenced by Gonzalez, which critics contend would make Massachusetts a so-called “sanctuary state” and a target of the Trump administration that has threatened to cut off federal funding to jurisdictions that don’t cooperate with ICE. Marion Davis, spokeswoman for Massachusetts Immigrant and Refugee Advocacy Coalition, said Baker shouldn’t need this new legislation to keep dangerous criminals off the street, arguing that they can already be held on whatever charges they face in Massachusetts. Davis aso noted that nothing in the Lunn decision prevents state police from notifying ICE of the pending release of a convicted felon or defendant so that federal authorities can respond. “This is only about detaining people, which as the Lunn decision explained, is effectively a new arrest,” Davis said.